Construction of new bioretention basins at the intersection of Egerton Road and Herbert Road in Arlington is almost complete, with plants being installed the week of Sep. 24. 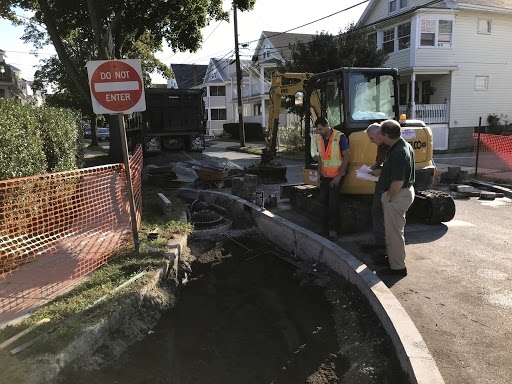 This green infrastructure project, built in partnership between Mystic River Watershed Association and the Town of Arlington, will help collect stormwater runoff and reduce pollutants discharged into Alewife Brook, thereby improving water quality. An added benefit--the plantings will beautify the streetscape and slow the traffic to make the road even safer for pedestrians. So what is stormwater runoff and why should we prevent it? Stormwater runoff is rainfall that falls on roads, parking lots, rooftops, and other paved surfaces that do not allow rain to soak into the ground. As the rain moves over the lawns and streets, it takes trash, oil, fertilizers--and anything else on these surfaces--directly into our streams and rivers without being treated. Stormwater runoff is the leading cause of pollution in urban streams like Alewife Brook, and green infrastructure projects like bioretention basins are a relatively low-cost way to mitigate pollution. What is the impact of the Egerton improvement on stormwater? 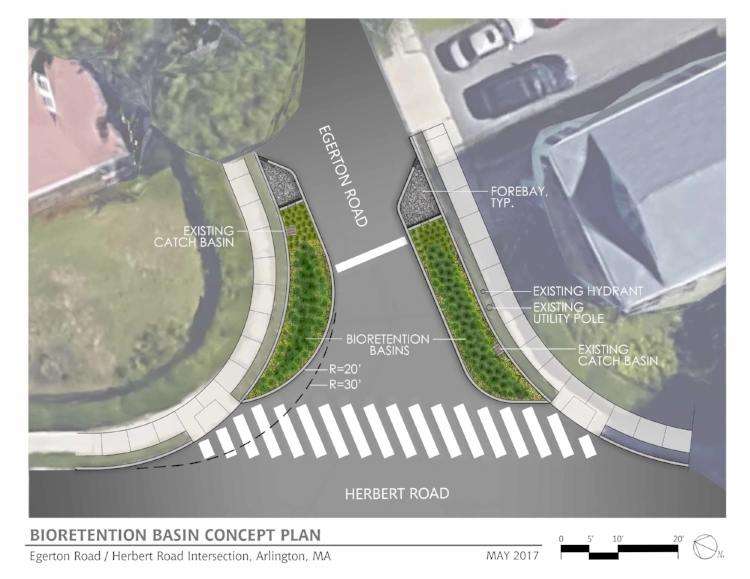 The designed improvements for Egerton and Herbert will divert runoff into new bioretention basins on each side of the street. This location was selected as there was significant runoff and the intersection was wide providing opportunities to build out curbs. Beyond reducing stormwater runoff in this location, the project can serve as a model for additional green infrastructure improvements. The sizing of these bioretention devices is designed to target the ‘first flush.’ First flush is the concentration of pollutants mobilized off of pavement and other surfaces at the beginning of a storm. Designing the structures to capture the first flush is a much more cost effective approach to reducing nutrients than designing to capture every drop of water in a storm. The basin are capped with native plants, and each year will treat and remove 20%-70% of a range of pollutants (see table below). The project was designed by Hatch and built by the Town of Arlington and Hatch. Beyond pollutants, vehicle passage was considered when planning this project, and the layout incorporates designs for improved vehicle movement around the sharp turn. Pictured below: Wayne Chouinard, Arlington Town Engineer monitoring progress and performing field engineering with D’Ambrosia Construction.